Why tackle smoking in your client group? Current: Why tackle smoking in your client group? 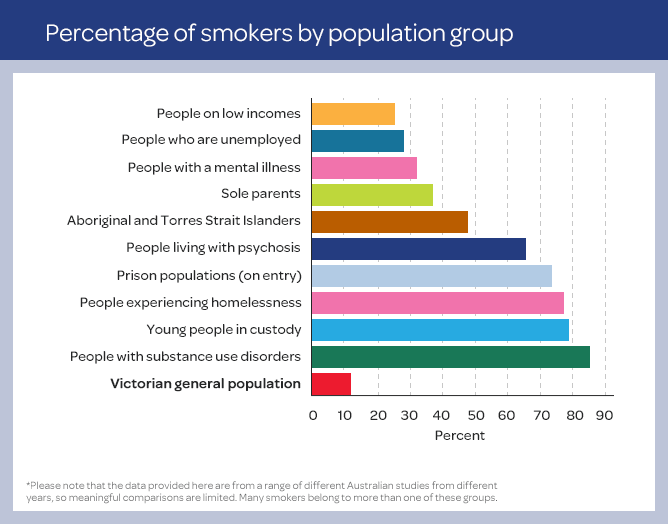 Smoking is one of the major contributors to social disadvantage in Victoria. The role of professionals is critical. Simply encouraging people to think about their smoking and its impact can help someone take the first steps. 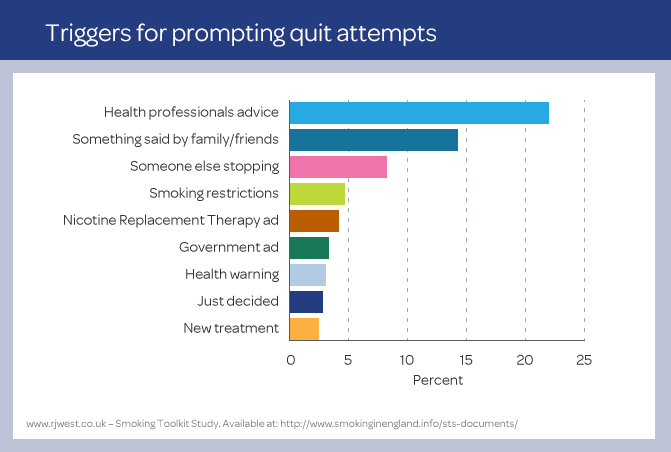 In fact, as seen in the table below, brief advice delivered by a professional is the number one trigger that prompts smokers to make a quit attempt. How can your service start addressing smoking? Learn how your service can take action and start providing support to clients using our AAH (Ask, Advise and Help) brief intervention model. Upskill and educate your staff on how to offer smoking cessation advice by enrolling into one of Quit Victoria’s free courses. Quit Victoria delivers face-to-face and online training specifically for professionals. Look at and consider implementing our Tackling Tobacco program within your organisation. The step-by-step program guides services on how to embed smoking cessation support into practice and create a smokefree organisational culture. The benefits of quitting smoking are endless. If you're looking for information to motivate smokers to push through and quit, we have a breadth of resources. Tackling Tobacco is a framework developed by Cancer Council NSW that services can implement to create a smokefree culture and reduce smoking rates of clients, staff and community members.